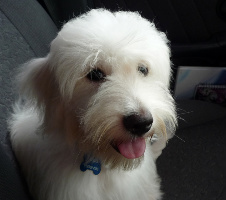 I`m a happy Coton owner, and I`m just writing to share the happiness this litte white cotton ball has brought to my family since he arrived! His name is Weezer, and he looks just like your Luc! How old is Luc now? Weezer is 4 month old. I felt like "wow, someone that far from me knows what i`m talking about when I say `coton de tulear`.."
Funny, isn't it? As you say in your website, it's very frustrating to get a blank look when you talk about your dog... the only person around me who actually knew the breed was my brother, who introduced me to Cotons....and to my Weezer. I TOO AM IN LOVE WITH THESE DARLING DOGS. BUT YOU ARE RIGHT, NO ONE KNOWS WHAT YOURE TALKING ABOUT, EVEN GROOMERS, DID FIND ONE INTERESTED ENOUGH TO LOOK UP BREED ON INTERNET. GUS IS ALSO A CHEWER AND I WORRY THAT I'M I'M GIVING HIM TOO MANY RAWHIDE BONES. HE HAS ALSO GONE THROUGH COMPUTER WIRES,SHOES,PILLOWS,WHATEVER HE FINDS BEFORE I DISCOVER HIM AT WORK DESTROYING, BUT HOW DO YOU GET MAD AT THESE LOADED WITH PERSONALITY,CUTE FURRY LITTLE FRIENDLY DOGS, I HAVE A HARD TIME. GUS IS 8 MONTHS SO HOPING HE WILL OUT GROW IT. HE HAS HAS ADDED SO MUCH TO OUR HOME, HE IS OUR ENTERTAINMENT AT NIGHT. GREAT LITTLE DOG! Wow, it's great to hear from someone from Brazil.